In the south of England today, we’ve had unpredictable weather. This morning was hot and sunny, promising a beautiful day. This afternoon, when shop owner Sharon was in her MG without a hood, the heavens opened and it rained heavily. So, it’s British weather- we can’t win! You can plan for beautiful weather in the summer all you like… but we can’t promise that it won’t rain. So, what do you do when it rains during your summer wedding day? wardrobe enhancements: Some of our dresses have hooks and loops underneath the skirt where you can lift up the skirt from the ground. You can ask for these to be put into your skirt. They are discrete- this is ideal if it suddenly rains, it saves your dress getting muddy! umbrellas: if you know the weather can be hit a miss on your big day, look into bridal umbrellas. For your guests, you could have a basket with large umbrellas near the door- this would also provide somewhere for your guests to keep their own umbrellas if they’ve got them. 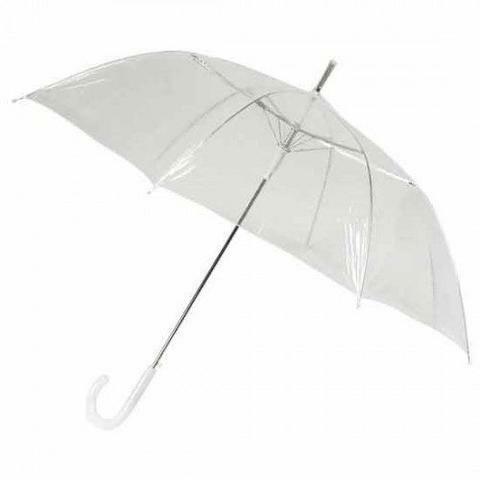 For yourself and your partner, you could invest in a bridal umbrella. touch ups for makeup: rain can ruin makeup! A good tip regardless of the weather situation is to get a bridesmaid to carry around a small purse with the makeup necessities to touch up during the day. This is especially helpful if the rain ruins your mascara. photography: talk to your photographer and plan alternative settings if it starts to rain outside. venue flooring: check that your venue for damp or poor weather. Water can seep through unsuitable flooring, making you and your guests soggy. Make sure your outdoor venue is away from mud (dry or wet), and make sure the flooring is suitable.